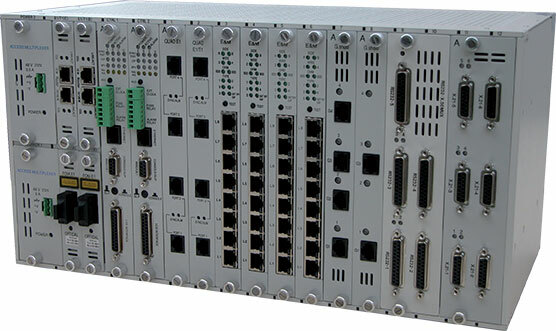 The QX3440 is a multiplexer with a 64 E1/T1 or 128 Mbps backplane for incoming and outgoing traffic. The high density concept gives it the capability to deliver a large number of voice and data circuits. The QX3440 is an E1/T1 DACS for the Telco infrastructure as well for the transport/utilities/energy networks which require a high number of analogue and data interfaces per node. The QX3440 is a non-blocking DACS for 64 E1/T1 interfaces or 1984 TS and will cross connect any voice or data interface. The system is designed with an automatic CAS fabric for voice on all slots. The QX3440 supports analogue voice (FXO to FXS, FXS to FXS in PLAR mode and E&M to E&M) and digital to analogue voice ( E1-CAS to FXS or E&M and E1-CAS to x E1-CAS). It can also be deployed as a channel bank with up to 120 or 144 voice channels from one or two 4 E1 / 4T1 copper or fiber optic modules. The QX3440 is used as an edge multiplexer or as an Add and Drop multiplexer in a ring, bus or nodal network with protection. CPU, cross-connect matrix, power supply and E1/T1 modules can be redundant if required. - PDHUPSR ring Protection per E1 with a maximum 32 E1 rings. This DACS is available in 2 models using the same cards : the QX3440 5U andQX3440-S 2.5U. The QX3440 is managed through the local console port or Ethernet port or a TS over an incoming E1/T1 port. Management is done in Telnet or in SNMP. 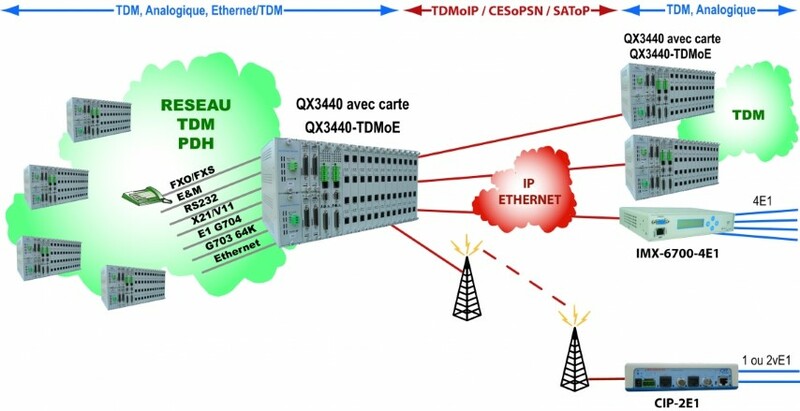 The QX3440-TDMoE card give to the DACS the access to the Ethernet or IP networks of transport. This card with a TDM throughput of 4E1 provide over the 2 GE up to 128 pseudo-wire to other hybrid devices like QX3440 w QX3440-TDMoE or toCIP-2E1 converter to 2 E1. The TDM traffic w or w/o CAS signalization is carried in TDMoIP, TDMoE, CESoPSN or SAToPSN encapsulation protocols. 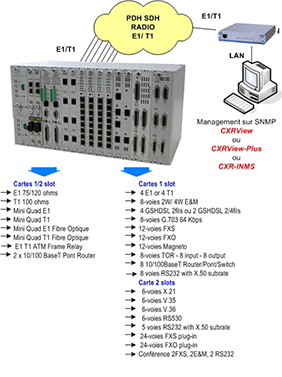 CXR provides two optional GUI and NMS systems based on SNMPc: CXRview or CXRview-Plus and an intelligent system CXR-INMS for large networks running with Linux and Oracle databases. 1 slot card : 4 E1, 3 E1-SNCP, 8 G703 64K (J64), 12 FXS, 12 FXO or12 magnetos, 8 E&M 2/4 wire, 8 Router/Bridge/switch, 8 port relays, 4 modems G.
Administration over V24, Ethernet or TS.